Mowing wet grass can be a tricky task. The thought of a drought seem so long ago. However, at the beginning of the year, Central Florida's grass was brown! That has not been the case for months, with afternoon showers almost daily. Sprinklers are needed less with the uptick in rain, which is good news for your water bill. What is not so good for your weekends is the yard work. If cutting the yard is on your list of things to do on the weekends, here are some helpful tips to keep in mind. Damp grass clippings can stick to the underside of a mower and form a soggy layer that quickly turns into a moldy mess. You can also use a putty knife to scrape off any hardened or clingy materials, but do so cautiously around the edge of the deck. 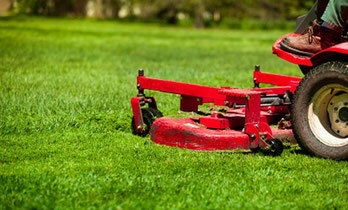 If your typical mowing schedule is every week, reduce that to five days or even less. This prevents the grass from getting long . Tall grass is difficult to cut. Tall, wet grass is even worse. Wet grass tends to cut less cleanly, resulting in larger clippings. Wet grass doesn’t mulch well and can fall out in heavy clumps. Rather than evenly spreading back into the lawn as mulch, these clumps can squash and eventually kill patches of lawn. Ideally, you should wait until the grass is dry enough so that you can walk through the lawn and not have wet shoes.